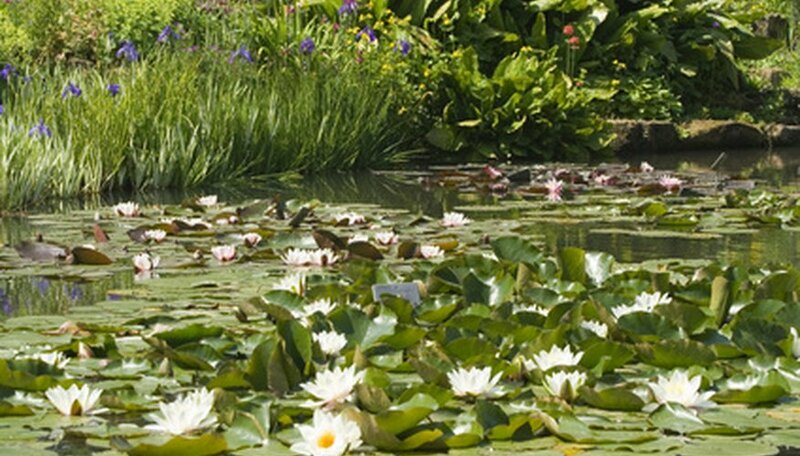 Selecting plants for a pond can be an overwhelming task. Aquatic plants are not only diverse in their leaf structure, bloom time, light tolerance and color but also in their tolerance of water depth. From floating plants to submergable plants, nearly all pond plants assist in the health of the pond in some way shape or form. Some plants, however, have more benefits to the overall health and aesthetic beauty of the pond than others. With roots that dangle beneath the surface of the water and waxy, green leaves with showy lavender flowers that grow above, water hyacinth is a free-floating plant with many benefits. While its invasiveness has resulted in a ban of water hyacinth in many southern states, it is ideal for quickly shading a pond. A couple of plants bought at the beginning of the summer will rapidly multiply helping to regulate algae, hiding underwater life from predators and providing an environment safe for fish to spawn in. 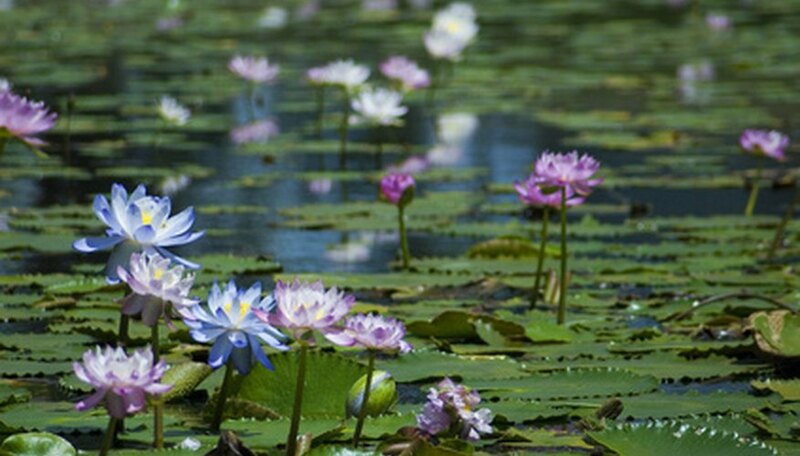 The water lily is another plant with leaves that shade the water and help to control the growth of algae. Unlike the water hyacinth, the roots of water lilies are anchored in a pot on the floor of the pond, thereby containing the growth of the plant and keeping it in one general area. Mid-summer begins the bloom-time of water lilies and the plant yields flowers in all different shades and colors; some tropical lilies even bloom during the night in vibrant blue and neon pink colors. 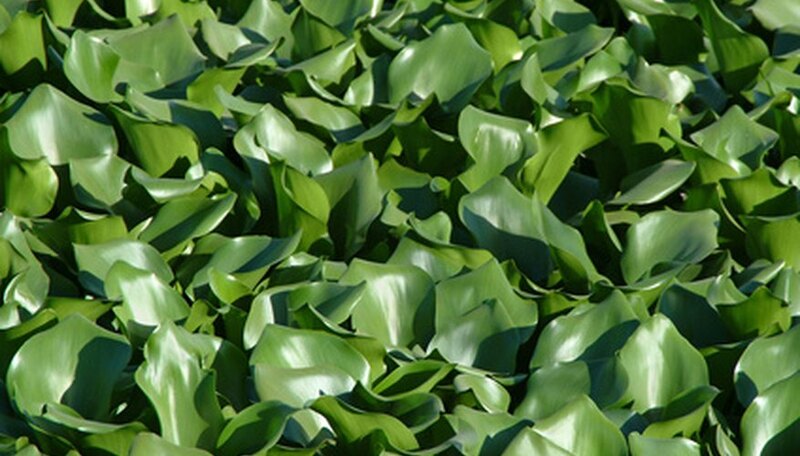 Anacharis is a plant invasive by nature and restricted in some states like the water hyacinth; containment is of utmost importance when placing this plant. Growing completely under the surface of the water, the fern-like leaves of anacharis transpire oxygen into the pond and use nitrogen in the water as fertilizer. Aquatic life also reaps benefits from this plant as its leaves attract turtles and fish alike. Lobelia cardinalis, or cardinal flower, is a marginal pond plant, preferring only its base and roots to be in the water. The lush, green foliage and cluster of red lobe-shaped flowers that bloom in late summer extend up to three feet into the air. The spectacle created by the cardinal flower is not only dazzling to the human eye, but to hummingbirds and butterflies as well. Beyond the aesthetic beauty of this plant, cardinal flower benefits the pond by keeping algae at bay and helping to maintain the overall health of the pond. Another plant that prefers just to have its "feet" wet is the variegated sweet flag. The foliage of Acorus calamus var. resembles that of a yellow and green iris. Unlike an iris, though, sweet flag does not possess the showy blossom but instead emits a sweet fragrance from its leaves. The yellow and green stripes are a striking vertical addition to any pond or water garden. Besides keeping the pond clean by using nitrogen as fertilizer, Colocasia esculenta 'Fontenesii' is unique in that it can tolerate both full sun and partial shade lighting. The large, purple, heart-shaped leaves of this taro make it a focal point of the pond until the temperatures drop. As a tropical plant, the violet-stemmed taro must be removed from the water for the winter months but its variable tolerance to light allows it to be overwintered indoors as a houseplant.